There was a time in the distant past when going to a nightclub consisted of bellowing opposite sides of different conversations at strangers, in murky, smoky grottoes packed full of malodorous, writhing bodies. 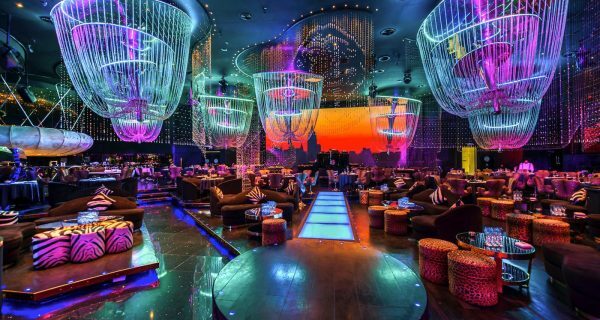 Don’t get me wrong – those experiences were valuable and they have their place… but sometimes you need to grow up and embrace the free-flowing opulence of a club like the Cavalli Club at the Fairmont Hotel Dubai. 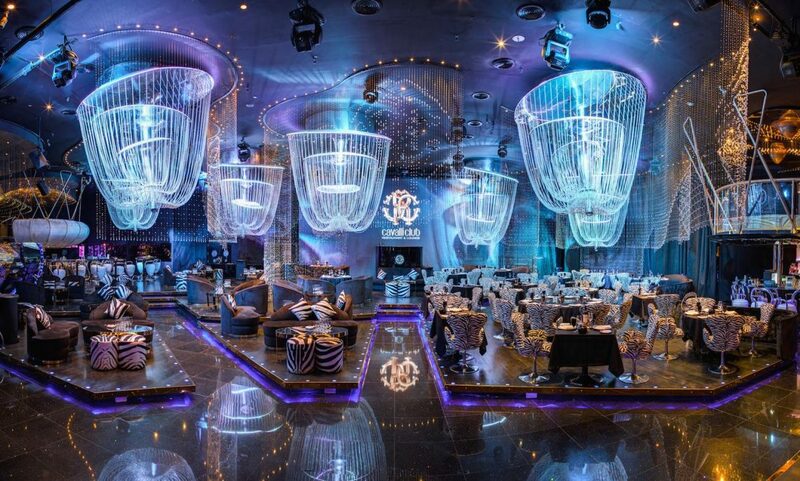 Having been inspired by – and created with – famous designer Roberto Cavalli, every corner of the Cavalli Club is dripping with the classic flair of the Italian fashion icon. 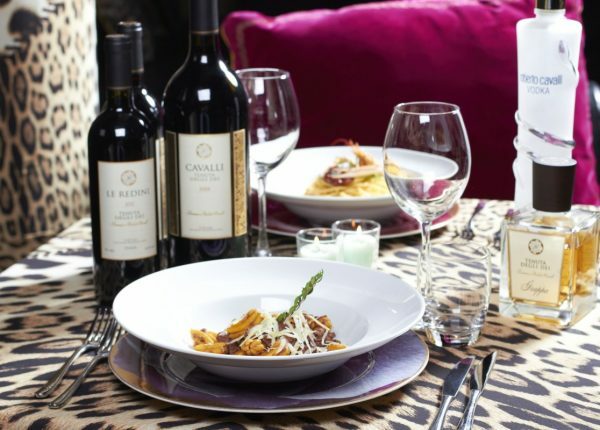 From the Roberto Cavalli cocktails to a menu in which the designer also has a hand, there is no moment of the experience that has not been aesthetically curated. 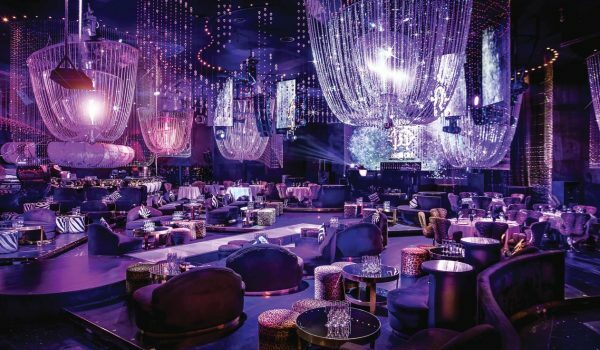 Leopard print chairs and white linen-covered tables are glitter-sprinkled by light reflected from Cavalli branded Swarovski crystal waterfalls and chandeliers. 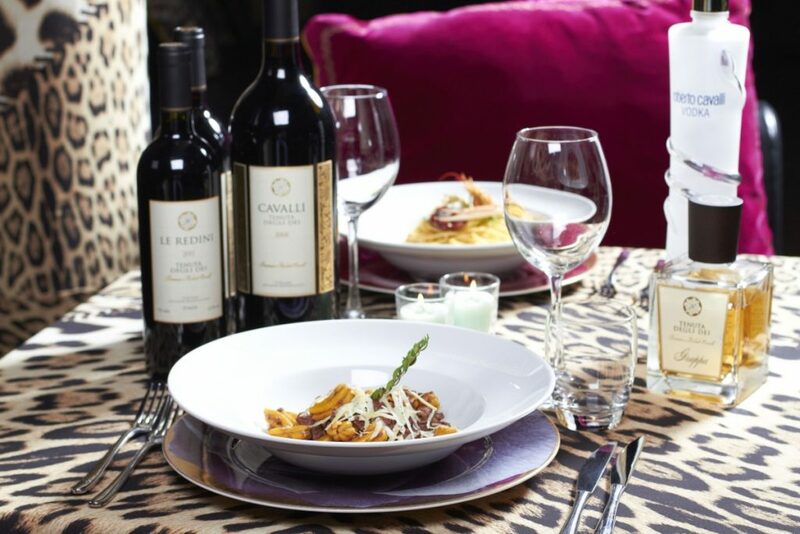 The most sedate way to experience the Cavalli Club is to begin with dinner. The Dubai institution that is ‘brunch’ can have many meanings which are a distant cousin of the late breakfast and some meanings which are so distant as to be unrecognisable. 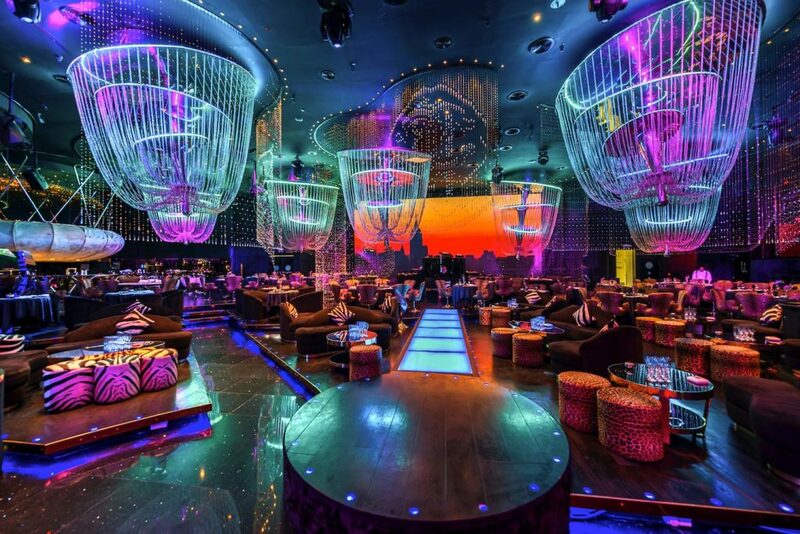 The Midnight Brunch at the Cavalli Club is one such thing, being a bottomless dinner and drinks with live entertainment, served prior to the opening of the club for the evening’s festivities. Our table was right by the front of the club, an area that would later become a stage and, later still, part of the dancefloor. Water is served in goblets stamped with Cavalli’s RC logo, but who drinks water at a bottomless brunch? We ordered margaritas while reading the menu and then sat back to enjoy the dinner with another couple of cocktails, although the bottomless brunch drinks do not include all the cocktails on the extensive bar menu. Throughout dinner, we were entertained by the skilled cabaret performance which included hits from Chicago as well as some lounge classics. Performing on chairs and on trapeze, the singers and dancers made excellent use of the space with acrobatics and got through an impressive number of (incredibly stylish) costume changes! The Italian style pervaded the food, beginning with a pyramid of single-bite antipasti such as arancini and beef bresaola. Our starters were simple but well executed, a low-temperature cooked egg on asparagus with parmesan for me and scallop saltimbocca with topinambur cream for Charlotte. Unexpectedly, a rather un-Italian option followed in a course of varied sushi, which we loved and of which probably consumed a rather unfashionable amount. Pasta followed, namely gnocchi in tomato sauce and agnolotti with chicken and aged balsamic, both of which were delicious and perfectly seasoned. Dessert was incredible and particularly of note because it is one of the few desserts that Charlotte and I have agreed upon: ravioli with meringue, chocolate and lemon. This was the perfect end to the meal and all our concerns about whether we had eaten too much to dance were put aside once the music started! 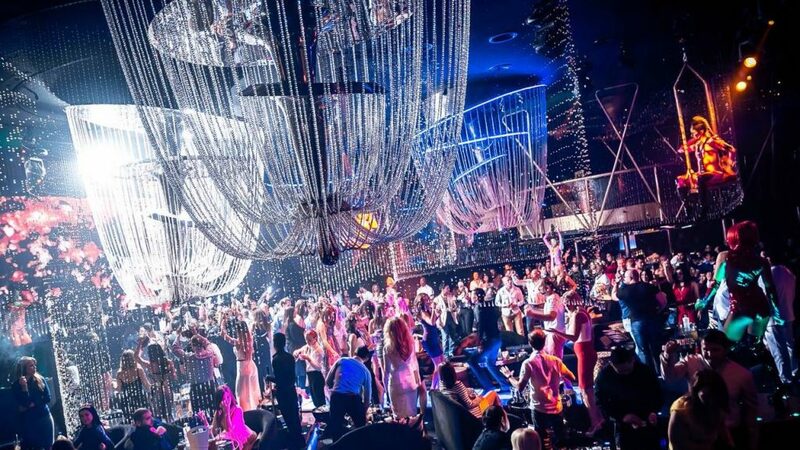 Once the dining tables were cleared away, we moved to seats at the side of the main dancefloor and the club started to fill with Dubai socialites and trendsetters. Music was a combination of upbeat classics from recent decades as well as more recent dance tunes, all of which proved very popular with the cosmopolitan crowd. 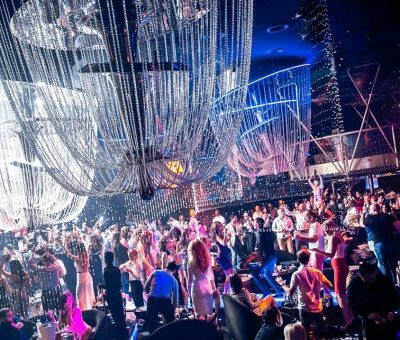 Oozing with glamour (and a million miles from the sweaty nightclub experiences of my youth), the Cavalli Club is the place to put on your dancing shoes and embrace Dubai’s epic nightlife!